I wandered out to the beach yesterday after getting groceries. I sat on the sea wall. The day was warm and calm. I could see a massive cargo ship in the distance and schools of dolphins popping up from the smooth surface. A few surfers were out in their wetsuits, along with a few desperate sunbathers. The moment was slow, like the clouds and the air, a bit stagnant, a bit warm, a bit cold. As I drove home to get my kids off the bus, I felt a bit annoyed, looking at the lawns in our neighborhood. The splotchy grass, the weeds taking over, some trees bloomed, some still looking dead. It’s the dullness of winter mixed with the rapid multiplication of summer. We are in the in-between. Welcome to March. This is why I have long struggled with spring. It can feel like purgatory. But perhaps my own cracks of annoyance are some sort of invitation? I recently finished up teaching a poetry workshop. We talked a lot about tone, which is what a poem is saying between the lines. It reveals the attitude of the writer towards the subject and towards the self. Tone is most pronounced when something is at stake, when something is at odds. It’s most noticeable when it’s at an angle. My tone towards spring is one of annoyance. I feel the rest vs. activity, the death vs. birth, the cold vs. warmth, the safety vs. danger. I want to be outside but outside makes me sick (allergies)! Can we please be either/or? But this isn’t life. Life is the tension, the in-between, whether it’s the weather or marriage or work or something else. Maybe spring is a lesson in making peace with that tension. I’ve been ruminating on Stephen Dunn’s collected poems. 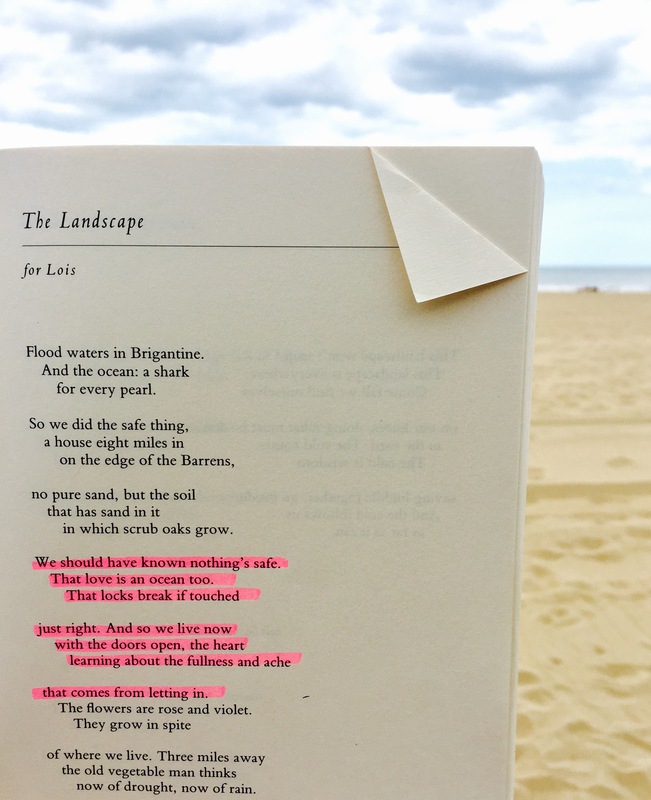 His poem “The Landscape” is exactly what I’m talking about. And the ocean: a shark for every pearl. Coming to peace with the tension in our lives makes us feel more whole. When I find myself wishing something was more of this or more of that, I loose touch with what IS, and what IS–that’s where the power is–that’s where the poetry is. The sharks and the pearls. Give me all of it. Give me the cracks. I will break them open and fill them back in. We should have known nothing’s safe. That love is an ocean too. that comes from letting in.